This well known, popular variety has been around a while now, but it is certainly standing the test of time. 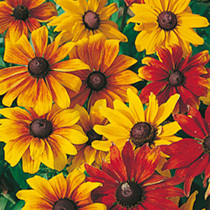 Large single or semi-double blooms in a host of autumnal shades. RHS Perfect For Pollinators. Height 50-60cm (20-24"). HHA - Half-hardy annual.